A magnificent unbeaten 163 from Rob Keogh combined with the bravery of Josh Cobb and Alex Wakely denied Derbyshire what looked a certain victory over Northamptonshire on a dramatic final day of the LV= County Championship Division Two game at Derby. Keogh batted for just short of six hours while Cobb and Wakely defied the pain of injured hands to steer Northants to safety at 390 for 9, 37 short of the 427 victory target and the club’s highest score ever to seal a draw. Cobb (43) shared a stand of 83 in 22 overs and after Rory Kleinveldt had helped add 75 for the ninth wicket, Wakely stayed with Keogh for the last 77 minutes to secure a thrilling draw although they were helped by Derbyshire spilling four catches. Northants went into the last morning needing another 387 to achieve their highest ever fourth innings total but their chances looked to have gone at lunch when they were 134 for 5. Mark Footitt quickly removed the nightwatchman Azharullah and Keogh should have gone on 11 in Tom Taylor’s probing opening spell but Matt Critchley spilled a simple catch at square leg. 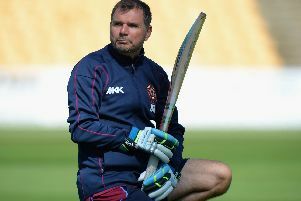 At the time, it did not appear to be anything more than an irritation as Rob Newton was bowled when Shiv Thakor defeated his shuffling defensive shot to break a stand of 51 in 13 overs. The introduction of Scott Elstone’s off-spin accounted for Adam Rossington who saw a firm clip smartly taken by Ben Slater at short leg to send Derbyshire into lunch well on course for victory. David Willey had counter-attacked brilliantly in the first innings but was heading back to the pavilion in the third over of the afternoon when an attempted cut at Elstone landed in the hands of Wayne Madsen at slip. Steven Crook swept Elstone for six but when he tried to repeat the stroke, the ball ballooned off his glove and Madsen ran from slip behind the wicketkeeper to take the catch to reduce Northants to 182 for 7. But the drama was only just beginning as Cobb came out to join Keogh in the first of three match-saving partnerships. Cobb was batting down the order after suffering from a sickness bug and he needed help from the physio when he was struck on the right hand. He was in a lot pain but battled on and Derbyshire’s frustration mounted when they dropped him on 24 and 33 while Keogh was given a second life on 114. Cobb was batting one-handed towards the end of his innings and was eventually caught down the leg side fending off a short ball from Ben Cotton. Wakely emerged from the pavilion to bat for the first time in the match and when the final hour began, his side needed 72 but although he swung Elstone for six, he was clearly in discomfort and he and Keogh opted to see the game out. Derbyshire brought back Footitt but he could not deliver and Keogh played out a tense last over from Elstone with eight players around the bat.